Do you consider yourself a multitasker? Able to finish numerous tasks in one setting? Let me introduce you to the GOgroove BlueSYNCTYM Bluetooth Wireless Stereo Speaker and Wooden Alarm Clock with NFC Pairing,USB Charging, and LED Time and Date Display. This alarm clock speaker system is the ultimate multitasker! Imagine having an alarm wake you up, then taking a call and later, streaming music from your favorite device. I didn’t even mention that it tells the time and date with large LED display. Yes, that was a give-in but did I mention it does all this encased in a beautiful dark wooden housing? And starting next Monday February 24th, Accessory Genie is crazy enough to offer $15 off when you purchase the BlueSYNC TYM using the coupon code ‘TYMTIME’ at checkout before March 3rd. It’s TYM to SAVE!!! The BlueSYNC TYM features an extremely user-friendly design. In addition to traditional Bluetooth capabilities, the TYM is equipped with NFC capabilities allowing you to tap the corner of the speaker to instantly pair your device. Easily stream your music wirelessly or plug into any non-Bluetooth device using the auxiliary cable. The alarm clock is built with a powerful driver on either side of the casing to deliver rich, room-filling sound at a variety of ranges for your audio enjoyment. 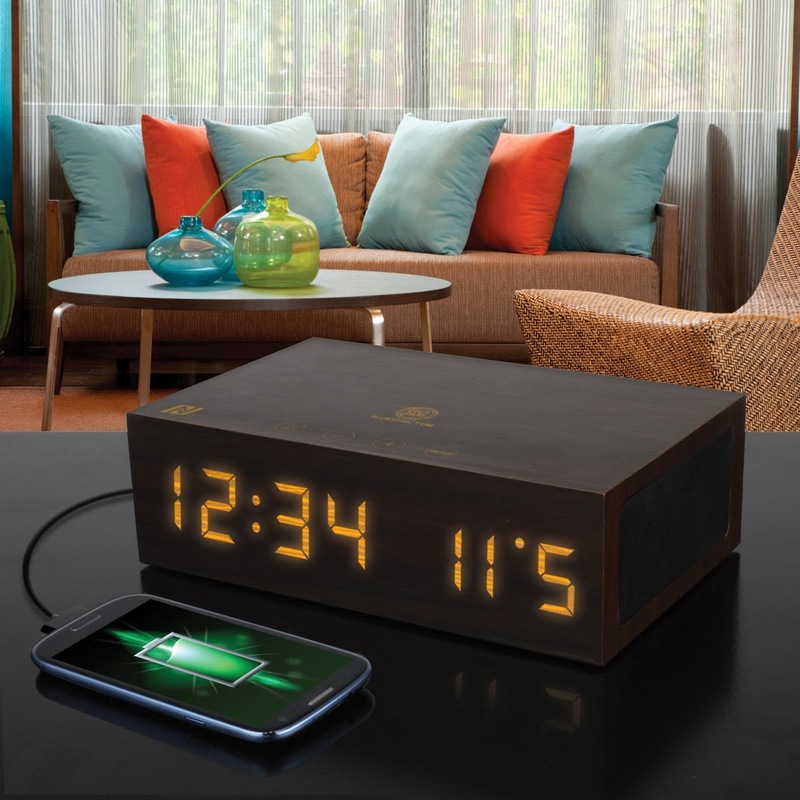 More than just a great speaker, the TYM also functions as an alarm clock, charging hub, and speakerphone. A bright LED display in the front allows you to easily check the time while onboard controls lets you change the time, set alarms, raise or lower volume and more! Equipped with a built-in USB charging port, you can use the TYM to charge up your phone or iPod while you’re sleeping or playing music. It also has a built-in microphone, so you can take calls on the TYM when paired with your phone. Remember starting February 24th through March 3rd, Accessory Genie is offering $15 off on every BlueSYNC TYM purchased with the coupon code ‘TYMTIME.’ Like all GOgroove products, the BlueSYNC TYM is backed by a 3-Year Manufacturer’s Warranty. Don’t miss out!